When I experienced the raw food diet, a world of health and beauty was opening―all I had to do was just walking in. The healing power of natural foods was highly effective for internal and external body, gave me a huge impact on my whole body. I learned how to detoxify my body, how to keep it extremely clean and how to nourish myself on a cellular level. I eat mostly raw food now and I feel amazing―healthy and active! I am 36 y.o. and feel like 25 again! I am 55 kg again, as in my 25 I hope my experience will help you to make your raw food journey easy and enjoyable! 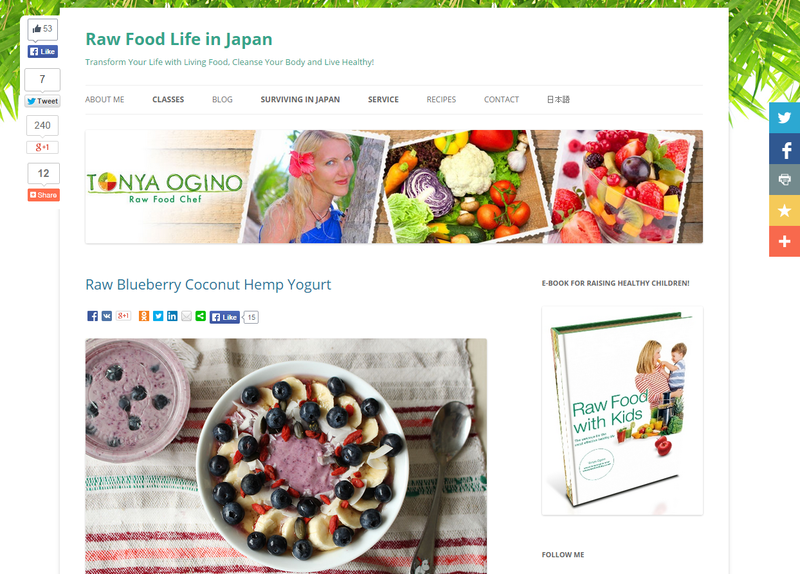 Raw food chef Tonya Ogino lives and works in Tokyo. She gives classes to mothers who are interested in raw foods and health and also teaches children the benefits. In March 2013, Tonya completed Fundamentals of Raw Cuisine and achieved the high standard of the Matthew Kenney method and philosophy of raw and living cuisine at Matthew Kenney Academy.